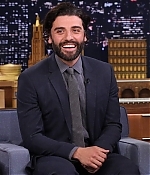 Oscar Isaac guest stared on The Tonight Show Starring Jimmy Fallon two months ago (March 30th, 2015), added to our gallery are stills from his interview where he was looking adorable in all smiles. Below you can catch a clip of where Oscar shares how his uncle earned a walk-on role in Star Wars Episode VII: The Force Awakens! Screencaptures from the interview will be added to our site when I get a chance.